Secom has come up with an autonomous flying surveillance robot that, when working in a pack or in tandem with one another, would be able to deliver added peace of mind. Considering how the world has turned out to be a more and more dangerous place by the day, it makes perfect sense to enlist whatever kind of help possible to help you in securing your property or area where you live. Just how does Secom’s autonomous flying surveillance robots work? For instance, whenever there is an unauthorized person or vehicle that enters a parking lot of commercial facilities, manufacturing plant, site of a storehouse, or other sites where it patrols, the robot will approach said person or vehicle, followed by snapping photos of it. This would come in handy for security forces to track a suspicious looking vehicle, as well as operate in areas where there are no surveillance cameras or cameras which are too far away to capture a decent shot or video recording. Of course, it does make one wonder whether someone with malicious intent would just shoot down these robots, and will the robot be smart enough to perform evasive maneuvers? Perhaps, or I might just be getting my imagination ahead of me. Still, this would greatly assist security forces around buildings to perform a more thorough check and patrol of the area for sure, and assuming Secom’s flying robots go about their business quietly, these mechanical automatons might just be stealthy enough to capture a robbery in progress. 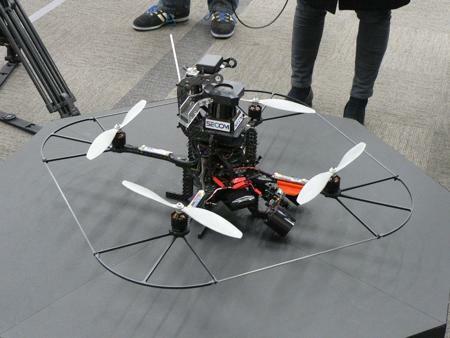 The robot will carry a laser sensor, camera, communication device, computer, and LED lamps among others, measuring around 80cm in diameter while tipping the scale at 1.6kg. It has a battery reserve that allows it to fly non-stop for approximately 15 minutes, and we do wonder what kind of CMOS sensor this bad boy to carry, as not all places it is going to patrol will be well lighted, and is there a flash function built-in?